We have original science fiction by Marissa Lingen (“Surfacing”) and Cat Sparks (“Hot Rods”), along with SF reprints by Michael Blumlein (“The Brains of Rats”) and Ursula K. LeGuin (“The New Atlantis”). 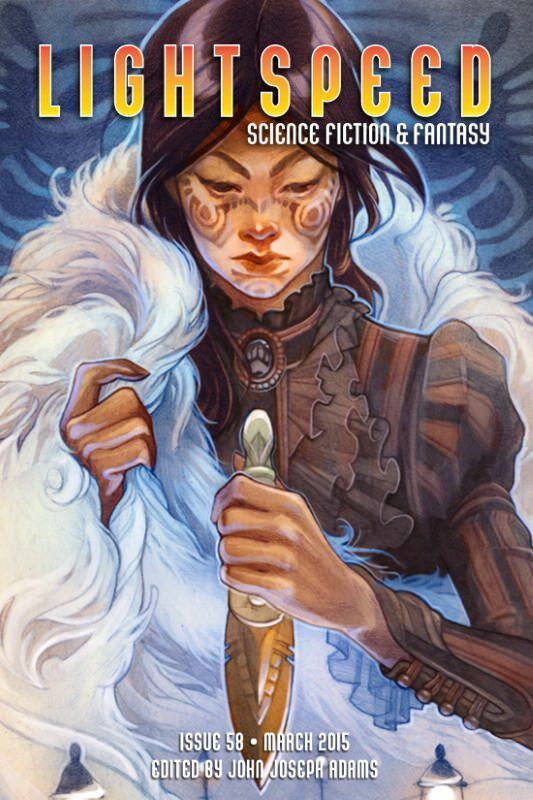 Plus, we have original fantasy by Matthew Hughes (“A Face of Black Iron”) and Vajra Chandrasekera (“Documentary”), and fantasy reprints by Linda Nagata (“The Way Home”) and Naomi Kritzer (“The Good Son”). All that, and of course we also have our usual assortment of author and artist spotlights, along with our review column and a feature interview with Patrick Rothfuss. For our ebook readers, we also have the novella “The Weight of the Sunrise,” by Vylar Kaftan and novel excerpts from Genevieve Valentine’s PERSONAL and Daryl Gregory’s HARRISON SQUARED.